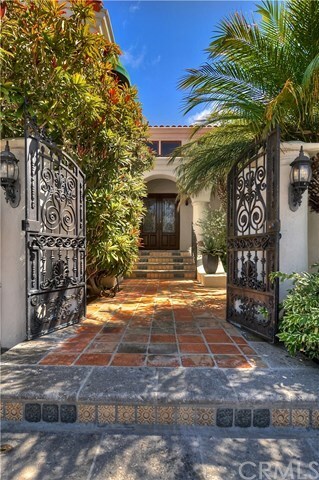 Welcome to this custom Mediterranean villa located in the prestigious 24 hour guard-gated community of Harbor Ridge. Rarely does such a special property become available in Newport Beach. The highest level of quality and meticulous thought of design went into this unique home with no detail overlooked. You will be transported to another place and time from the moment you enter the double wrought-iron gates & into the gorgeous courtyard with cascading water fountain & elevated veranda area. The home offers primarily single level living with 4 bedrooms, 4 full baths (each bedroom offers an ensuite bath) & 2 half baths, family room, formal dining room, den, separate office (optional 5th bedroom) & large laundry room. Four sets of French doors open from the spacious and bright breakfast room to the beautifully landscaped rear yard with built in BBQ, water fountain & enchanting viewing deck offering panoramic ocean, Catalina Island & city lights views. A compelling blend of European charm & escape, a spectacular venue for indoor/outdoor entertaining. For the automobile enthusiast, the home offers a 4 car garage and driveway space for 3 more vehicles. Truly special one-of-a-kind and sophisticated home that transforms you. Harbor Ridge development offers 4 pools and 3 tennis courts. It is nearby stunning beaches, Pelican Hill Resort and Golf Course and the world-class restaurants & shopping at Fashion Island, Corona del Mar Village & has great freeway access to John Wayne Airport.